The Food and Drug Administration has announced new safety measures for a class of opioid medication used to treat moderate to severe chronic pain. Opioids are powerful - patients who suffer from chronic pain say the medications can do wonders. But if they fall into the wrong hands or are used for recreational purposes, these meds can cause serious harm, including overdose and death. “Although many Americans don’t realize it, prescription drug abuse is our swiftest growing drug problem. Many of those abuses involve opioids," said Dr. Margaret Hamburg, commissioner of the Food and Drug Administration. "In 2008, nearly 15,000 Americans died where opioids were involved. In 2009, that number went up to 16,000." 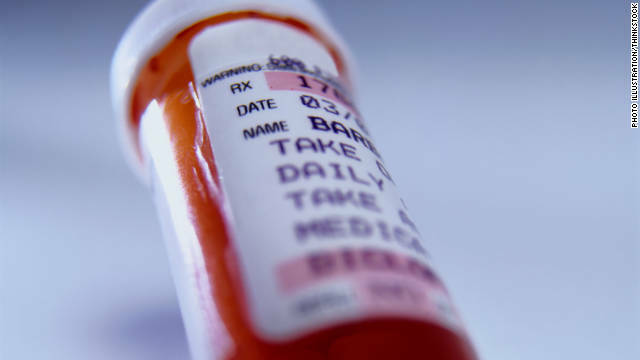 In order to cut down on abuse but still get these medications to the people who really need them, the FDA has provided a blueprint to more than 20 companies that manufacture opioid analgesics on how best to educate physicians who prescribe them. The education guidelines will include information on weighing the risks and benefits of opioid therapy, choosing patients appropriately, managing and monitoring patients, and counseling patients on the safe use of these drugs. In addition, the education will include information on how to recognize evidence of, and the potential of, any opioid misuse, abuse and addiction. Manufacturers will also be asked to provide an “easier to read” information sheet for patients, explaining the ways to use the drugs, what the dangers are and the best way to discard the drugs if they are no longer being used. “The number of opioid overdoses in the U.S. is higher than heroin and cocaine overdoses combined,” said Gil Kerlikowske, director of the Office of National Drug Control Policy. “People need to know how to use the drugs, and what happens if they get in the wrong hands." The FDA expects manufacturers to meet their obligations by giving educational grants to drug education providers, who will develop and deliver the training for physicians and heath care workers, as they do with other drugs. The plan, known as a risk evaluation and mitigation strategy or REMS, is part of the government’s initiative to address the prescription drug abuse epidemic in the U.S. The FDA hopes that manufacturers will have their continuing opioid education plans in place by March of next year. A litle too little, a little too late. Greed is behind the problems of opioids and medicine, as we all know refused to educate themselves about pain care-and government ignored the cries of people in pain- and still do. The FDA, CDC- bought and paid for by modern medicine-if the public wants change in pain care theyll have to demand it for neither government nor medicine cares much for making real changes in pain care. What isn't addressed is the horrific withdrawals for long term use with little or no support from doctors. As one who suffers severe chronic degenerative back pain, I have been overdosed by pain management physicians who take no responsibility. Opioid use needs to be treated carefully and the patient deserves complete advisement of the debiliting withdrawals. I have learned only from online forums how to get off or decrease dosages. I now prefer to suffer the pain then go through the horrific detox phase taking up to two months of my life to get my head straight. That's the real primary issue, abuse is secondary and is perpetuated to deflect from holding doctors accountable. Also using.Tylenol as a filler for more profit is risky to ones liver health. Cvs & Walgreens is are biggest street provider, then there's dr's & staff, so those in pain get nothing, not a fair system. Broke foot out of state & dr's were to afraid to give loratabs for broken foot. Was so upset, then wondered if as I left his office, was he writting heavy duty drugs for his own discretion? Cvs & Walgreens got in trouble for street selling. Where will the help come from? You are right, the DEA targeted my psychiatrist. And it's all a bunch of #$#^&! Have restructured right leg, with pins & rods, need an act of congress to get pain relief? Those of us who are smarter than to abuse them, cuz we need them to continue life. But you lump us up with all drug & alchol abuse also, we don't huff paint, or smoke crack, drink & drive! Wow they are going to fix? I'm a chronic pain patient whose pain results from an incurable condition called Kyphoscoliosis. 8 1/2 years ago this condition began to manifest itself as my spine began bending towards the right and front. Upon researching the condition, I learned that the end result of this condition is death as the bending spine begins to crush the heart and lungs. I then consulted the heads of the orthopedic and neurological clinics at Stanford University. There, examination and testing confirmed the existence of my condition. At that point, I was given two choices, i.e., an adult long-rod procedure wherein 11 to 12 levels of the spine are fused using metal rods or to continue taking the opioid medications prescribed for me by a very understanding and caring primary care physician, who had already subjected me to testing and examination by numerous specialists. The testing included trials of so-called pain medications such as Cymbalta, Toradol, and Tramadol, which not only failed to give me any relief from my pain but also made me sick. Thus, upon seeing the specialist at Stanford, it was already known that opiates were the only medications that not only controlled my pain but also stopped my spine from bending. The recommendations of the Stanford specialists are noted above; however, I must also note that both specialist strongly recommended that I do not consider the adult long-rod procedure as long as the opiates were working because of the high probability of the failure of said surgery and the known complications associated with it. Well, with this information, I made my decision, and for the last 8 years I've been taking Morphine Sulfate ER and Oxycodone hcl without any problems whatever and with the ability to lead as normal a life as possible. One thing I don't need is the government interfering with the practice of medicine, especially when it comes to chronic pain patients like me. From what I've read of the FDA's actions, I have no problem with the REMS as education is always a good way to address a problem. And, from what I see, both physicians and patients could use some education in this area. As for me, I read extensively on the subject of treating chronic pain with opioids and thus educated myself on the risks associated therewith. However, not every chronic pain patient can or will do what it takes to educate themselves and this is were the REMS will play an important role. I have severe chronic back pain issues, from surgeries done as the result of a car accident in 1978. The fusions, etc., along with myself, did quite fine, but I didn't keep to the life long restrictions I was given, as I had a family to support so I took what jobs were available, while attending school. In 1994, I started to have bad pain in my lower back, (I had extensive lumbar damage from the wreck. ), my right hip and right leg. Just like "caliguy58", I went to specialist after specialist, who all agreed that surgery was my only option, to remove the grafted bone that had kept forming and is now pinching on the nerve roots, coming out of my lower spine. But, not one of them would touch me, due to the liability issues, if they happened to nick a nerve or I didn't get the desired results, that would accompany such a surgery. So, after being fed and injected with all kinds of steroids and anti-inflammatory agents, such as Vioxx, etc., which did absolutely nothing. (I don't know the damage they caused, over and above the heart issues with Vioxx and Propoxyphene HCL, which I was given for a time.) I even begged the last few Dr's. to just cut my dang spinal column and stick me in a wheel chair, where I could at least still work, but of course, they would never do that and was certain I would then have 'phantom pain', which I believe is just an excuse, as not every amputee and paralyzed person gets it. In fact, the percentage is quite low.Then and only then was I able to get a script for opiates. In over 18 years of this heII, I have been prescribed my meds by only two Dr's. The first was my family Dr. of nearly thirty years, but he retired in 2009 and I am now seeing the Dr. he had hand picked to take over for him. I have only used one pharmacy, but in two states, the first being my place of residence, when this all started, but after having lost all my friends and eventually my marriage and family, I returned to my native state, but have used the same chain pharmacy, that I did in the first state. The pain meds, a muscle relaxer and an anti-anxiety med I get, along with meds for my blood pressure, I keep in a large gun safe and never admit to anyone, I don't know or am just acquainted with, that I even get any such meds, due to all the thefts and people who would be hitting me up for some, because they claim they hurt themselves, doing something or other, but won't go see a doctor, themselves. I take the absolute minimum amount of the opiate meds, to dull the pain enough, to where I can grit my teeth and endure the remaining pain, so I can still function, as I am pretty much alone. I still have to travel to the first state to see the doctor, for exams and refills, as the Dr's. here want to run the tens of thousands of dollars worth of test, again, for their own benefit, (And Profit), which will do nothing more than to show that it has gotten, progressively worse, over time. I worry each and every time I hear about some new regulation or that some group is already fighting against a new class of opiate meds, which will come on the market, next year, without any Tylenol, (Acetaminophen HCL), in them, that it will get harder and harder to get the meds I need, just to survive. The drug companies are doing that to stop the largest single cause of liver failure and resulting deaths, which is a Tylenol overdose..
Its criminal how poorly doctors have treated people in pain. Not too long ago doctors operated on children with no analgesics. 25% of children undergo painful procedures with no analgesia. Both medicine and government are inhumane and stupid when it comes to people suffering pain. I do not take any of these for long term, but have needed Percocet after surgeries for a week or so. I am concerned that any pain assistance medicine be taken away from legitimate physicians. Therefore, I empathize with Cali and Idaho and agree that they will take this hysteria too far and harm people who need these medications. Isn't heroni (diacetylmorphine) an opioid? “The number of opioid overdoses in the U.S. is higher than heroin and cocaine overdoses combined,” said Gil Kerlikowske, director of the Office of National Drug Control Policy. Mr Kerlikowske doesnt care about peoples pain- he is ignorant of what people in pain endure and wouldnt stand up in a 5 minute conversation with someone like myself- like most in government he cant see past his own nose. Its all about the money- doctors, government and pharmaceutical companies are too far removed from the public good. When they think og pain all they can think about is money. The lousy pain care is proof of that. Since when are opioids the only treatmetn for pain. The reason doctors overuse opioids is that theyre too lazy to properly assess and treat pain. Prescribing an opioid is a quick way to make a buck without having to care for a person in pain. Note well how many medical organizations are opposed to being required to have education in pain care. Its medicines moral and mental laziness behind opioid misuse. To any person who does not think the pharmaceutical companies are not the drug king pins, wake up. Its common sense that these drugs are highly addictive and that makes the companies.....highly profitable. Its all greed greed greed, there is absolutley no reason most of these pain killers should even be prescribed. Anti- depressant not working???? we have another pill for that ( we knew the first pill wouldnt cure your problems) .... People, wake up!! Life is tough, we all have problems..... solve the problem, dont swallow pills to make you NOT CARE about reality.....pills wont make the problem go away and these greedy pigs want you to believe everything they tell you. Do some reseach, pharmaceutical companies want you addicted. Politically they rule..... not our weak goverment which is also fueled by greed, fear and more greed. As a person who suffers from chronic pain (RSD, Cancer Neuropathy, Fibro) I am very concerned. The Physicians for responsible opiod prescribing are advocating for many other changes as well. My doctor informed me today that the PROP . group has already been successful in having breakthrough medication limited to just two pills a day. Now they seek to have chronic pain patients only receive medication for 90 days. PROP advocates against long term pain manage ment with opoids. I AM NOT A DRUG ADDICT and tired of being treated like one. I do not like taking opoids for pain BUT those meds help me get through a day with tolerable pain. Only a chronic pain patient can understand the oxymoron of "Tolerable Pain"
If PROP is successful, I predict more suicides from people unable to tolerate the pain as what little quality life most enjoy will be plagued with horrific untreated pain. I have worked in heltah care for over forty years and my partner is an RN on a med/surg unit. We often discuss pain management and find the biggest barrier is an accurate understanding of pain, its subjective nature and the many faces of pain: physical, social, psychological, spiritual, and others. Health care professionals need training in understanding pain itself. The doctor prescribes opiates, the psychiatrist antidepressants, the friend tells you get another partner, and the pastor encourages prayer. Understanding pain means understanding its many faces rather than the dogmatic one sided approach that so often is practiced. Those who lack accurate empathy tend to be abusive in their relationships.